Consciousness is always moving and evolving. At this moment in history, I believe we are being guided in a very specific direction, and many of us are feeling a compulsion to make changes in how we treat ourselves as we participate in a larger collective transformation. In this piece I want to describe one of the more counterintuitive parts of this process, one that is often misunderstood by people as they encounter it on their journey. Here’s what tends to happen. As we move into a place of greater self-compassion and vulnerability in our daily lives, we start to allow for a more authentic connection with others. Gradually, this creates opportunities for the formation of safe communities, which are a natural locus for healing. At this point, the intelligence of our bodies comes into play. In community, the animal part of us recognizes what our conscious minds are usually unwilling to know: that the environment is safe enough to thaw out some of the personal trauma that we have been keeping frozen inside us. This can seem pretty scary to the conscious mind, as all our old fears and trauma patterns start to spring to the surface, apparently without any provocation. It feels like you’re cracking open, and in a way you are. It’s the transformation a frozen river experiences at the beginning of spring. Not long ago, a new person came into my circle of community. Initially, she worked hard to remain fiercely independent and focused on what she was able to offer to others in the group. Over time, though, her animal body began to recognize that it was in a safe container where she was being genuinely seen. Despite her best efforts to keep uncomfortable emotions at bay, they eventually came rushing to the surface, and the frozen river began to flow. My friend was embarrassed and mortified. She felt that by showing up that way, she was tainting the community somehow. But because we had all been through our own experience of thawing, we understood what we were seeing and could hold a compassionate space without needing to fix or change the unfolding for her. We just kept the space open and allowed the river of thawing emotions to flow. For my friend’s conscious mind, this was her worst nightmare: it seemed that this level of vulnerability and rawness would surely cause the group to reject her. Instead, she slowly came to see that through the experience, her connections with each of us had deepened and become more authentic. Because isn’t that what we really want from each other, after all? To be fully accepted exactly as we truly are? In the months and years and decades before our moment of safety that lets us melt, we are still being taken care of by the intelligent animals that are our bodies. We have to be able to operate in this world, and if it isn’t safe to face a past trauma or deep heartbreak, you won’t be forced to feel it until it’s genuinely safe to melt. Sometimes that trauma needs to stay frozen until we find a warm space and at least one compassionate witnesses where you can completely fall apart. Your body’s intelligence is vast, and this is the part of you that simply knows when it’s ready to thaw. But as with anything in nature, safety and thawing can happen by degree. Community isn’t the only form of safety, and completely falling apart isn’t the only way our bodies choose to release. 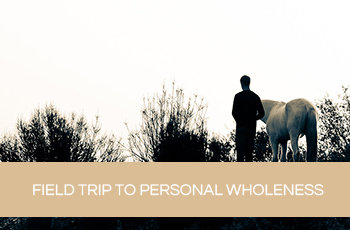 Equus Coaching sessions often provide a similar container that allow clients enough safety to let go of some of their frozen trauma. 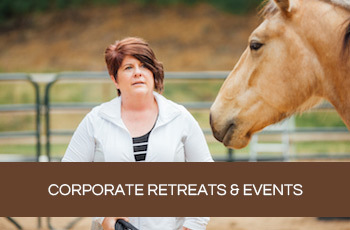 A client will come into the round pen, in a positive mood, excited about engaging with the horse. Within a few minutes, they’re sobbing – and they have no idea why. They’re feeling emotions they weren’t even conscious were there but which have been waiting patiently, often for years, for a moment when they can finally emerge. The client isn’t aware of any emotion initially, because it’s still frozen inside them. But the animal body recognizes the safety created by the dedicated space and time of the session combined with the compassionate witnesses of the horse and the coach. Within the container, there is nothing to accomplish, nothing that is expected of you. They’re not going to be judged by me and they’re certainly not going to be judged by the horse. They can feel the stability and the balance that comes from the environment of nature, a space that can hold presence for anything that wants or needs to arise. It happens all the time: once clients have been given a few minutes, very strong emotions begin coming to the surface. They ask me, “Why am I feeling like this?” The answer, of course, is that somewhere deep down they know they are safe. It’s an unexpected answer because the release of emotion tends not to feel safe to the conscious mind. To be seen and witnessed and understood by another being, especially another person, is such a fundamental part of feeling safe. I encourage you to examine your life for opportunities to allow safety to warm you enough to begin making cracks in your frozen river. It takes courage to surrender, to allow the river within you to thaw in the nascent springtime of each safe moment. It’s also one of the ways we can bring our lives into harmony with the natural world and into the direction that the intelligence of life wants to move us. The old consciousness looks like trying to make our lives into a manicured garden with even, cut lawns and perfect edges. As we mature into the new consciousness, my belief is that our lives will more and more resemble the chaos of the natural world. It grows wild and indiscriminate. It isn’t neat but it is magnificent and interconnected and infinitely intelligent… and a river runs through it.